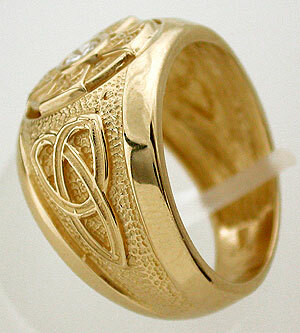 Available in gents or ladies 14kt ring of the Celtic Cross with a trinity knot on either side. 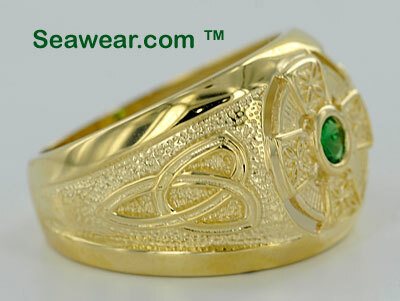 The rings comes in a stock size of approximately 6-7 (M-N for Ireland) and 10 (U for Ireland). This is the only size they are made in and offered. Your local jeweler can size your finger and size it to the exact size you need! Approximate weight sare 4-5gms for ladies and 7-9gms for gents. The stone in the center is a green CZ. Any jeweler can replace that for you with an emerald, diamond or whatever you choose. 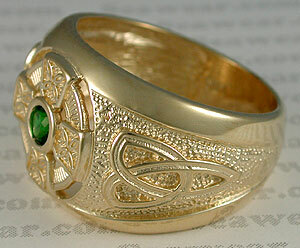 The face of the gents ring is 5/8" or 15mm tall and tapers to 5/16" or 7mm wide in the back. 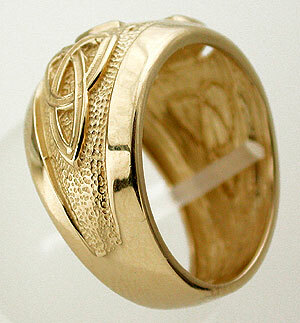 Ladies ring is just under 1/2" or 12mm and tapers to a little over 1/8" or 4mm in the back. 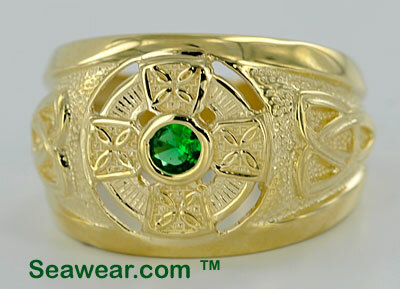 The ring has several finishes as you can see in the close ups, with high polished edges, textures, raised relief and cut out edges around the circle of the cross. 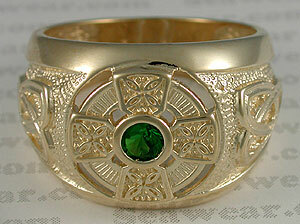 The Celtic cross trinity ring is made in the USA with the lost wax casting method. These have limited availability and are often out of stock if the shopping cart is removed.